Bluewater Energy Services, headquartered in the Netherlands, was founded in 1978 and specialises in tanker-based production and storage systems. The Dutch offshore energy company signed up to a berth on EMEC’s tidal test site in November 2011. 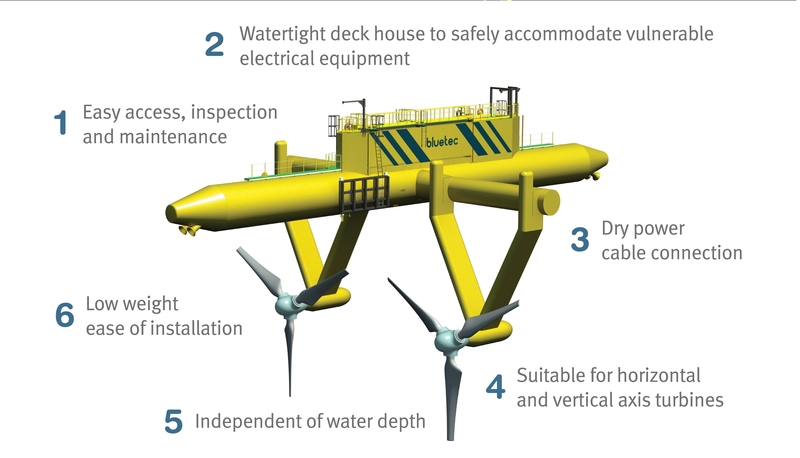 BlueTEC is a floating support structure suitable for any type of tidal turbine aiming to ease installation and maintenance costs of tidal turbines, while at the same time potentially increasing energy production locating turbines closer to the sea surface – the most energy rich part of the water column. The platform measures 24m x 40m and requires a water depth of at least 8m. It can host horizontal and vertical axis turbines. Project partners are Italian turbine developer Ponte di Archimede (PDA) and Scottish-based Environmental Research Institute (ERI).